[156 Pages Report] The oil & gas composites market was valued at USD 1,482.0 million in 2015 and is projected to reach USD 1,986.0 million by 2021, at a CAGR of 5.0% during the forecast period. In this study, 2015 has been considered as the base year, while the forecast period is from 2016 to 2021. The increasing usage of composites in the oil & gas applications provides various advantages such as light weight, high corrosion resistance, and that they are well-suited to the increasing operating pressures which can reach 20,000 psi. Additionally, the low weight of composites results in lower installation costs and high corrosion resistance property in harsh environmental conditions, making composites components a maintenance free solution in the oil & gas industry. These properties of composites have resulted in the replacement of corrosion-resistant materials for the construction of oil & gas components. The composites in the oil & gas industry are being widely used in structures such as piping systems, jumpers, risers, downline, gratings, ladders, walkways, handrails, decking, flooring, fracballs, fracplugs, flexible tubes, composite riders, accumulator bottles, BOP, caissons, among other applications.. The research methodology used to estimate and forecast the oil & gas composites market begins with capturing data on key company revenues and raw material costs through secondary research. The product offerings are also taken into consideration to determine the market segmentation. The bottom-up procedure was employed to arrive at the overall market size of the global oil & gas composites foam from the revenue of the key players in the market. After arriving at the overall market size, the total market was split into several segments and sub-segments which are then verified through primary research by conducting extensive interviews with key people such as CEOs, VPs, Directors and executives. This data triangulation and market breakdown procedures were employed to complete the overall market engineering process and arrive at the exact statistics for all segments and sub-segments. The market for oil and gas composites has a diversified and established ecosystem of its upstream players such as raw material suppliers and downstream stakeholders such as manufacturers, vendors, end users, and government organizations. Some of the manufacturers of oil and gas composites include Airborne Oil & Gas (Netherlands), GE Oil & Gas (U.K.), Magma Global Limited (U.K.), National Oilwell Varco (U.S.), Vello Nordic AS (Norway), Schlumberger Limited (U.S.), Halliburton (U.S.), Strongwell Corporation (U.S.), Enduro Composites, Inc. (U.S.), and ZCL Composite (Canada) and others. In May 2016, GE Oil & Gas planned to manufacture hybrid flexible composite riser which will weigh up to 30% less than conventional pipe. This may help the company to provide operational capability in water depths of 2500–3000 m.
In April 2016, Magma Global Limited partnered with Victrex Polymer Solution (Lancashire, U.K.), a division of Victrex (Lancashire, U.K.) to develop deep water subsea oil & gas pipe solutions. This helped the company in providing solutions for hydraulic pumping and light well intervention in the Gulf of Mexico. In March 2016, Airborne Oil & Gas B.V. entered into a partnership with Hydrasun (Aberdeen, U.K.), one of the world’s leading providers of integrated fluid transfer, power, and control solutions to the oil & gas industry. This strategic move helped the company for faster delivery of TCP jumpers thereby increasing its market share. What are the upcoming trends for oil & gas composites in developing nations? The oil & gas composites market is estimated at USD 1,482.0 million in 2015 and is projected to reach USD 1,986.0 million by 2021, at a CAGR of 5.0% from 2016 to 2021. The increasing demand of non-corrosive and lightweight materials in oil and gas industry and low maintenance cost of composites are the key drivers of the global oil and composites market. The pipes applications in oil and gas composites market is projected to be the fastest-growing application between 2016 and 2021. This growth is attributed to the increase in production of shale gas and growing hydraulic fracturing activities, thereby increasing the demand of composites risers, jumpers, flowline, and so on. This is because these composite components offers complete solutions against highly corrosive fluids and harsh environment conditions at various temperature, pressure, adverse weather, and soil conditions. Fluctuation in raw material prices and the availability of low-cost substitutes are the major restraints in the oil & gas composites market. Many low-cost substitutes of composites are available in market, including steel, copper-nickel alloys, duplex/super duplex stainless steel, titanium, and so on. High prices of glass fiber and carbon fiber in comparison to traditional materials such as steel, titanium, and copper-nickel alloys are preventing the mass adoption and utilization of composites in oil & gas industry applications. Many applications of composites have been discovered; however, these are not yet commercialized owing to high costs. Asia-Pacific is projected to register the highest CAGR, in terms of value and volume, between 2016 and 2021. The growth is mainly attributed to the rising demand for superior properties exhibited by the product from applications including pipes, tanks, top side applications and others. It is also backed by increasing partnerships, agreements & contracts and other development strategies. These are some of the key growth factors driving the market in Asia-Pacific. The oil & gas composites market by application type is segmented into pipes, tanks, and top side applications among others. Composites pipes are gaining importance in the oil & gas industry because they provide more structural strength compared to the metallic alloys and are light in weight. Composite pipes generally use glass fiber reinforced polymers and offer complete solutions against highly corrosive fluids and harsh environment conditions at various temperatures, pressure, adverse weather, and soil conditions. Composite pipes are used in oil transportation, onshore fields, and offshore fields. 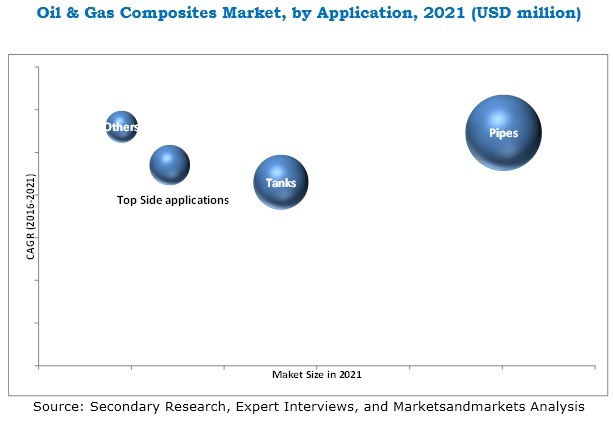 Composite tanks are the second biggest application after pipes in the oil & gas composites market. In the oil & gas industry, composite tanks are most widely used for the storage of the fluid transported through pipe systems. The increasing problem of corrosion and underground leakage has widely led to the adoption of composite materials for the construction of tanks. Top side applications include grids/gratings, hand rails, ladders, decking, and flooring. These are being widely used globally on fixed and floating off-shore platforms. However, in top side applications, corrosion is a major problem due to its contact with the water most of the time which creates a huge the expense for the oil & gas industry. Therefore, the use of composites helps to reduce the life cycle costs of the installation and do not corrode like metals or rot like woods. It helps to increase their durability and weight-saving capability over metal. What are the upcoming hot bets for the oil & gas composites market? How market dynamics is with regards to development of new applications of oil & gas composites? The market for oil and gas composites is rapidly gaining importance; however, few factors, such as capital-intensiveness of the industry, availability of low-cost substitutes, and high initial and production costs are some of the major challenges and restraints faced by the oil and gas composites market. Airborne Oil & Gas (Netherlands), GE Oil & Gas (UK), Magma Global Limited (UK), National Oilwell Varco (US), Vello Nordic AS (Norway), Schlumberger Limited (US), and Halliburton (US) are the few leading players in the oil & gas composites market.